Olivia Bellamy has traded her trendy Manhattan life for a summer renovating her family's crumbling holiday resort. Tempted by the hazy, nostalgic memories of summers past - childhood innocence and the romance and rivalries of her teens - it's the perfect place to flee after her broken engagement. But what began as an escape may just be a new beginning...As Olivia uncovers secrets buried thick with dust, one by one her family return, their lives as frayed at the edges as the resort. 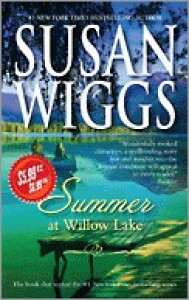 Summer at Willow Lake is a promising start to a series, but an awkward start all the same. The author seemed to have her hands full with the plot, multiple sub plots, and introducing the characters for the series and the flow and character connection suffered for it. The story line itself was good and I loved the secluded New York camp setting. This is one of those books that I have had in my eReader for a long time and am glad to have read it. I am hoping that now that the introductions have been made, the series will improve from here.